You must make reservations at least 5 minutes in advance of the time at Zocca. Pull into the Westin Riverwalk porte-cochere on 420 W. Market Street. 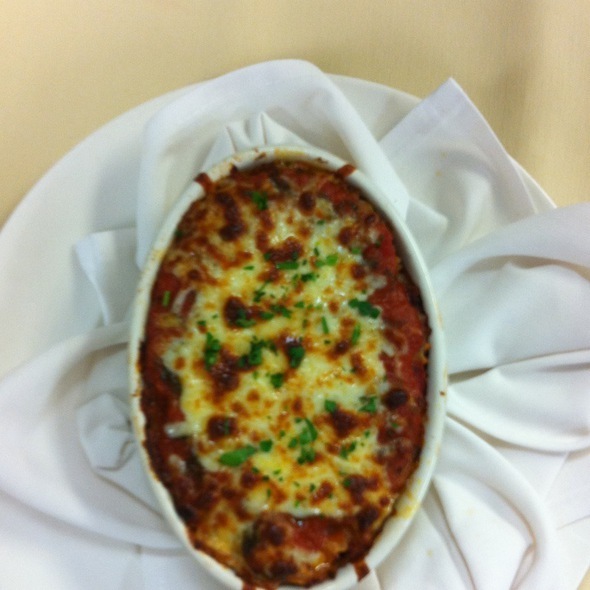 Reduced Valet parking is offered at $8.00 when dinning with us in Zocca. 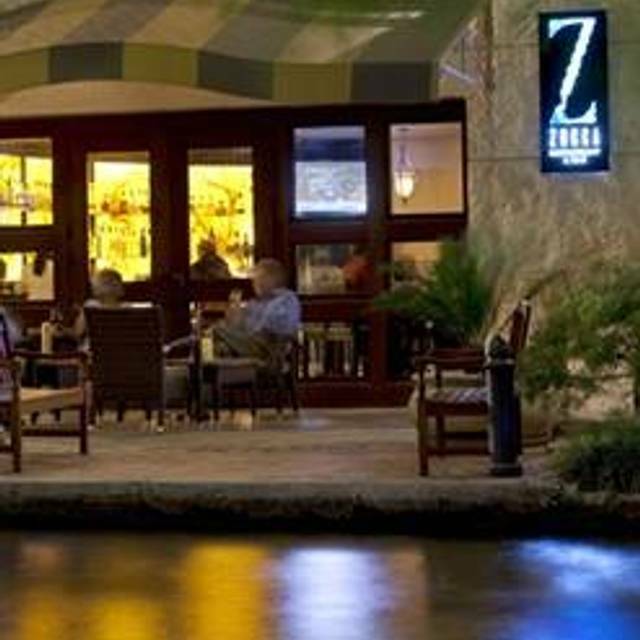 Zocca offers contemporary Italian cuisine, fine wine, and cocktails at one of the most scenic spots on San Antonio’s renowned Riverwalk, where towering cypress trees shade the restaurant’s riverside patio. Zocca’s casually elegant interior of burnished copper, rich wood, and handsome onyx panels creates a relaxed, welcoming ambiance. The culinary artists in Zocca’s kitchen bring a contemporary spin to traditional Old World flavors, focusing on locally-sourced, seasonal ingredients to create delectable and memorable dishes. Zocca’s private dining options can accommodate from 10 guests to 100, in an al fresco patio setting to the convivial Chef’s Table to buy-out of the entire restaurant. 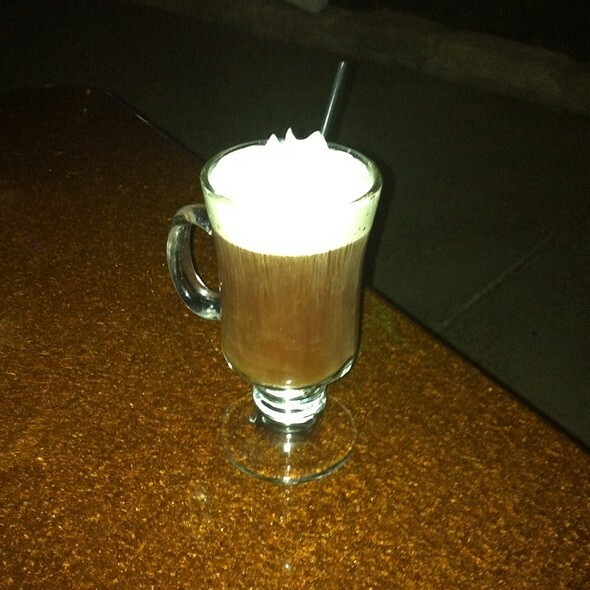 We chose Zocca because of its quiet location on the Riverwalk. The food was excellent! Alissa, our server, was very attentive and made our dining experience very enjoyable. Friendly staff, a great location, and excellent food....that's what we all want! We'll be back! I had eaten here a few years ago (bruschetta, caprese, Piccata, creme brulee) and was extremely impressed but unfortunately this meal was underwhelming. My wife and I elected for appetizers and dessert for this meal (caprese, calamari, creme brulee, and choclet roulad), having had a fantastic late lunch at La Fogata. We were pleased that there were waterside tables available since this part of the Riverwalk is very nice and quiet. The caprese salad ($12) was comprised of small quartered tomatoes and small chucks of cheese whereas last time I ate here it was broad thick slices of tomato with large medallions of cheese. There was no comparison between the 2 and the salad tonight wasn't up to par even to a lesser restaurant. The calamari ($14) was a small portion and not good by anyone's standards as it was mushy and tough at the same time although it did have small bits of fried lemon which was a treat. The creme brulee ($10) was unremarkable and perhaps the smallest portion I've ever eaten as the small dish was half depth of a typical creme brulee dish. Probably only half as large as the last time I dined here when it was ample and tasty. 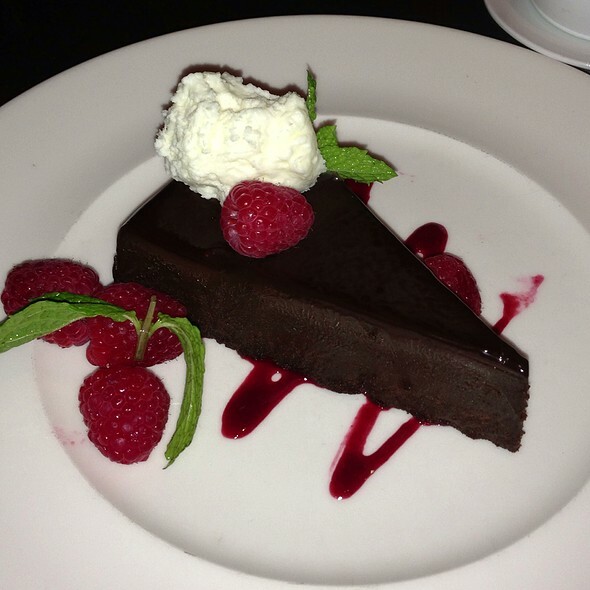 The chocolate dessert was very pleasant ($10) and the best part of the food. 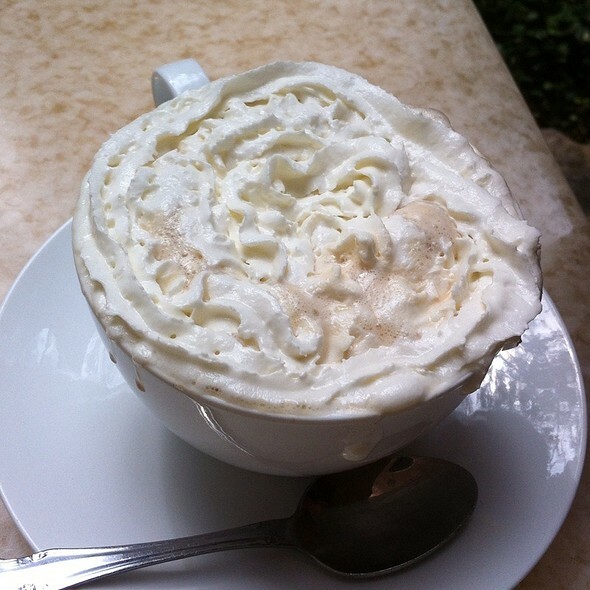 The cappucino ($5) was large but weak but they were nice enough to bring me an additional shot of espresso. Our server was in training and both he and the experienced server did an excellent job. I will give them another chance based on my wonderful experience from a few years ago and the excellent location on the Riverwalk but this was not a experience worthy of any loyalty. Orlando was our server and he was great. The food was not so great. Wife had bolognese, normally her favorite dish. She didn't eat more than a couple of bites. Me and my sous chef daughter tried it...we then understood why she didn't like it. I had the orreciette with rabbit in a red wine reduction. It was average at best and the sauce didn't taste anything like a red wine reduction. The Westin hotel, where the restaurant is located, was great and the server, Orlando, was great. The food was not good. Food was amazing. Full portion full flavor done Devine. Service was good. Suffered from lack of attentiveness. Very good and interesting modernist, creative Italian cooking. The actual restaurant space itself is not especially appealing being rather sterile. Had lunch on a rather rainy day, so the RiverWalk was not at its best which maybe didnt help mch. Food was over priced and not very tasty. Our server was very nice though. We had a great time and a delicious meal! We sat outside on the river which was perfect. I’m vegetarian, and the chef came outside and personally spoke to me and created a signature dish just for me. He came and checked on us after we had received our meals as well. The food was delicious and the plate presentation was amazing! Ambiance was nice. Food was good, not spectacular, which was disappointing given the price. Staff was pleasant but overwhelmed, forgot items multiple times. Overall a decent experience, but likely to go elsewhere next time. The food is mediocre, expensive for the poor quality, and the service is even worse. It was a very delightful evening with my wife, we both enjoyed the food & the staff was very respectful & very nice! Will definitely be coming back again! Not cheap, but exceptional quality, creative menu especially good choice on gluten free, safe for celiacs. Quieter location on the riverwalk, so 👌 for a special meal, would definitely return. My husband and I came here for our 25th wedding anniversary. We made reservations on open seat, but were the only people there for a while. Our waiter was diligent and the food was great. The head chef, Jessica, came out to see what we thought of each menu item we ordered. She also informed us of some of the activities happening around the Riverwalk that weekend. We really enjoyed the quietness compared to the chaos on other parts of the Riverwalk. We returned two more times that weekend and will likely just stay at the Westin if we should return to San Antonio. This was our second trip to This wonderful restaurant. The meal was delicious and the service wonderful. We ate al fresco overlooking the river. Very disappointed with Zocca. Terrible experience from the get-go. Online information states valet parking is free, but it is not, only discounted. However, the truly awful part of the experience was the fact that we were seated in a far end of the restaurant despite the fact the inside dining room was fairly empty. Then, we waited 20 minutes for a server (while 4 different people including the person who seated us told us someone would be with us shortly). We finally decided to leave and saw that a person was just then bringing water for our table. Having eaten there years before, the level of service we received was beyond disappointing. I'll add that I was disappointed in their menu, which hadn't changed much over the years and is needing some updates and new dishes. However, we will not be returning. Clearly, this is a restaurant that receives lots of guests due to its location and previous reputation, but has now lost its appeal. It's an OK kinda place. Conveniently located if you are staying at the Westin. Terrible waitress. Forget just about everything and said “gentlemen” about a thousend time, way past annoying. Food was terrible, cook has never been to Italy apparently. Bruchetta was on a brick instead of toast. Half way through I gave it up. Then the spaghetti. Not al dente but mushy in a ton of saus. The spoon and parmesan I asked for, came after some 10 minutes. So did the red wine. What a mess. Never again. No dessert, no tip. Nice Riverwalk location but the food was mediocre and it took over an hour to get pizza. Would not go again. Very noisy, poor service and mediocre food. Plenty of better choices in the area. Overall experience not good. My husband and I were wanting some carbs for a half marathon we were running the next morning. The whole experience was pretty lousy. It took a while for the waiter to come over initially to take our drink order. He was very scattered. Took a while to get the bread, never did get the waters we asked for at the beginning of the meal. He took our order then left. Ten minutes later he came back and asked if were ready to order. We got the salads after some time. The kale salad wasn’t that great. The pieces were way to big for the fibrous green. Needs to be chopped finer. I ordered the spinach gnocchi and my husband the pappardelle. We wound up just splitting that. I had to send back the gnocchi. Way over cooked. Some were even crunchy. The pappardelle wasn’t bad. Enough to split. The waiter comped the gnocchis. For the price and quality, it wasn’t worth it. The view was nice looking into the Riverwalk. Overall thumbs down. I took my girlfriend there Saturday night for a romantic dinner. We initially got seated indoor and the lights were bright and it was very noisy. We sat for at least 10 mins before we were greeted by a server assistant. We asked to be moved outside as we were looking for a quieter atmosphere. It was cold outside and all other tables had a heater and we did not . Our server never greeted us. Like we never even saw a server come outisde! Thankfully the server assistant was checking on us and eventually got us drinks and food. The server greeted us after we got our entree and apologized for his terrible service. I told him I agreed it was the worst service ever. I told him I had just proposed to my girlfriend at the table so we were in good spirits but it was overall terrible. We were never treated in a special way at all. Even after we told him we just got engaged 5 mins prior we ordered a dessert and the dessert came out with "happy Anniversary " written across the tile. We laughed it off. We were given a bill for $160 and felt like the quality of service was awful for our bill amount. I would've been happen to have paid twice that amount if anyone would've given us the time of day. Another table was seated near by us and someone turned a heater on for that table so my now fiance was able to feel some heat. Also at the end we mentioned to our server that we noticed the other table getting oil with their bread and I asked if that was a usual thing because the whole time we were eating our bread we kept saying that would have paired well with some oil. He said yes we should've gotten that and apologized and asked for us to come back another night when they weren't so short handed on staffed . Just terrible over all experience and I guess we won't forget the night we got engaged with the worst possible service ever!!! Would've been nice to have a manger come talk to us. We wont be recommending this place to anyone. Glad the food and my company were great! Not enough staff. Had to wait almost 20 minutes to be greeted by our server. Food was mediocre and not worth the price. I would not recommend this restaurant. 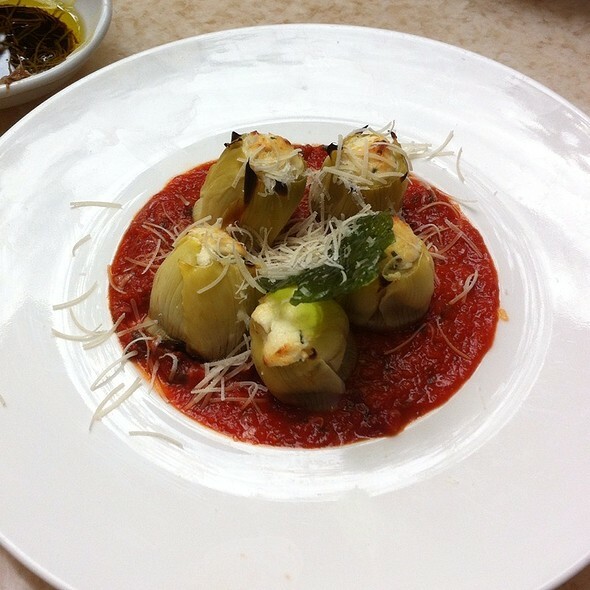 Wonderful Italian food in a romantic setting on the Riverwalk. Our server was attentive but not in anyway intrusive. Great wine selection and plenty of soft drink options too. 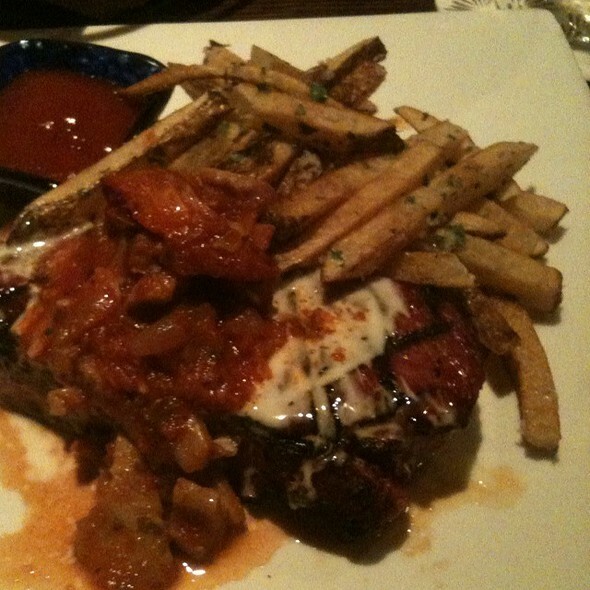 If we visit San Antonio again, we would definitely go back to Zocca! Great experience and the osso bucco was amazing! The gluten free selection is how I found this restaurant and the taste and value is why I keep going back. The Pappardelle is my favorite dish right now. I would take anyone on a date or a friend who is in town and not be nervous. Our waiter was absolutely fabulous and so was the kitchen staff. We ordered wine and a Caesar salad to start which came out extremely salty. The waiter took the salad back and the chef brought us calamari as a replacement which was a nice gesture. 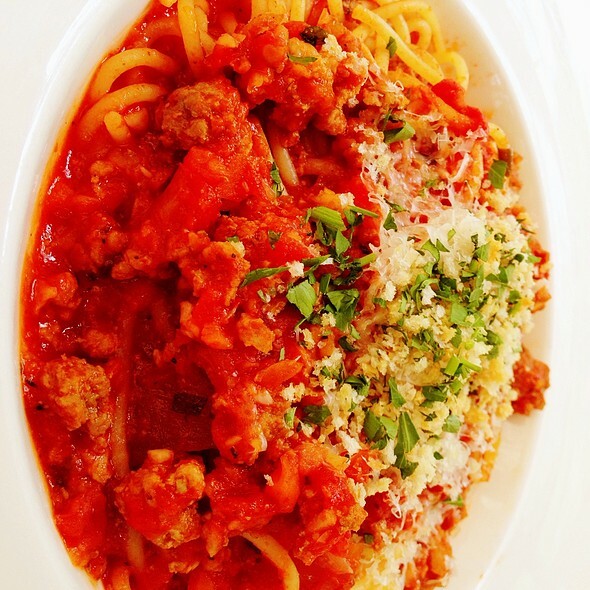 I stuck with the classic spaghetti and meatball meal and it was delicious! I'm normally picky about red sauce but this hit right on the spot, plus the meatballs were amazing. The overall ambiance is okay, a lot of kids and large family parties, but that is expected since it is attached to a hotel. I would maybe go back and sit in the bar area, a little darker and better ambiance for a date night. The main course special Surf and Turf filet was tough and flavorless. I asked them to try again and after waiting 30 minutes it was the same. Our server apologized and said it was the seventh time that night. The manager never stopped at our table. Server comped a free glass of wine and of course removed the charge for the main course. The octopus and lobster tail was good. Management in the kitchen should have stepped up and just removed the special until they had better cuts of meat. I had the most beautiful anniversary at the restaurant. The food was amazing and they serve you a lot you d get what you pay for. The waiter was amazing, Orlando made our anniversary special. Next time I go I'm going to ask for him. Overall the dinner, restaurant, service, and just everything was outstanding and beautiful. Table reservations were not met. They tried to make up for it but the flowers were wilted and on the verge of dying. I asked that the table be set on arrival and it was not, they brought them after we were already seated for close to ten minutes. Food was great but the pre setting not so hot. My wife and I enjoyed a quiet peaceful valentines dinner at Zocca. We both ordered the Alfredo. She had chicken and I had shrimp. Both were delicious and served hot and fresh. The wait staff was courteous and professional. I would definitely go back. The environment was nice and quiet. Our waiter was attentive and polite. The food was incredible! 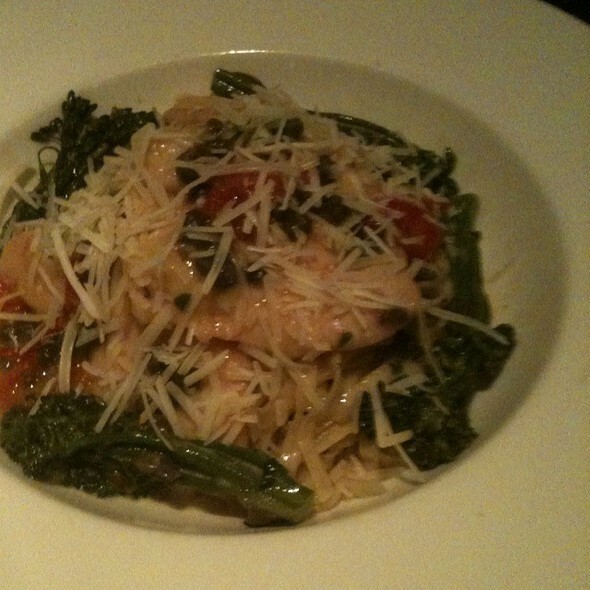 Do yourself a favor and order either the Spinach Gnocchi with Shrimp or the Spaghetti. You would regret not getting either. My only regret was accidently leaving our leftovers in the hotel room. This mistake will haunt me for the rest of my life... 11/10 will go again. It was a very elegant place. My fiancé and I went there for valentine's day. Absolutely loved it! Andy our server was very gracious ,knowledgeable and service oriented. He made our evening enjoyable. Food was great with nice presentation!!! Everything is always perfect! Love this place. We went for Valentines Dinner and it was wonderful. Even received a rose at the end. Thank you! Overpriced and the food okay at best. As an owner in the Westin this was a disappointment. No white table cloths was very surprising given the price point. No view of the river walk because there was scaffolding blocking the view. It looks as if the scaffolding was there a long time. The bright spot was the waiter was very eager to please and polite. I don’t recall his name but he was new to the restaurant. They haven’t changed their menu in about three years. They used to have a variety of delicious breads and now they do not. They have unusual entrees such as rabbit and even though I appreciate fine dining their menu is limited and ordinary. The description on the menu does not equate with the meal that is actually prepared. I had the brick oven chicken that basically tasted like rotisserie chicken with this jelly sauce . I had my wedding reception here several years ago and I’m guessing it was under different management . We had the bananas foster pizza which was just this brown dough that wasn’t sweet with a few bananas on it and some kind of sauce . The waiter was really nice though. Our cocktails were good but they served the Cabernet that we ordered at the wrong temperature. In a nutshell this restaurant has lost its finesse and special memories for us.